In their first action since being elevated to No. 1 in the nation, the Tennessee Vols barely escaped with a win at Vanderbilt. 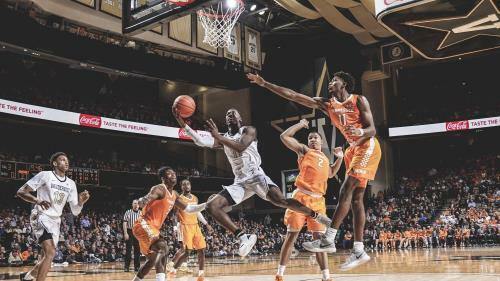 Tennessee started with a 15-2 lead, but trailed by six late in the game on Wednesday at Memorial Gymnasium in Nashville. The Vols rallied to tie at 76-76 and Grant Williams, who scored 43 points and hit all his 23 free throws, had a chance to win it. However, his last-second shot attempt was blocked. The Williams performance at the line broke the Tennessee records for most free throws in a game and consecutive free throws in a single game, surpassing Bill Justus' 22 made and 18 consecutive free throws vs. Ohio on March 17, 1969. It's the second time UT has ever been ranked No. 1 in the country, joining the 2007-08 team. That season, the Vols' first game after earning the ranking came against the Commodores on the road. Vanderbilt won. Tennessee improves to 17-1, 6-0 SEC. The 2007-2008 team started 16-1. Vanderbilt has now lost its first six conference games.